They’ll tell you you’re BRILLIANT and AMAZING. You are BRILLIANT and AMAZING. That’s what they’ll tell you when you’re lost and befuddled. You are doing a marvellous job. You are all this baby needs. You are enough and everything. They are the cheerleaders and the noticers. You are such a good mother, they’ll say. and you cry in the crooked carpark and complain on Twitter. They’ll tweet back and say, you poor thing, o Brilliant and Amazing one. and look after the kids so you can go to bed and watch Queer Eye. means 9.15pm when the last kid is asleep and you can check Facebook for an hour in peace. and you need to double your fees. and quote research about the high-performing brains of mothers. so why the hell not believe them? 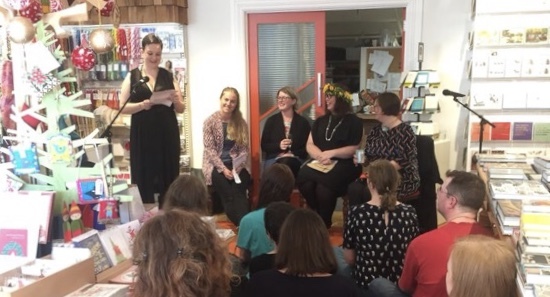 Emily Writes introducing the (girl)Friends contributors, Jessie Moss, Holly Walker, Gem Wilder and me, at Minerva Bookshop. I wrote this poem for Emily Writes’ (girl)Friends LitCrawl event, and read it tonight to a bookshop full of lovely people who laughed in the right places. Thank, Brilliant and Amazing ones, everywhere. If you’ve enjoyed this, you might like to check out my Facebook, Twitter, Pinterest, and now: PATREON! Do you know your refugee facts?